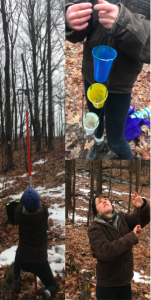 In spring 2017 and 2018, I employed novel canopy-sampling methods using elevated “bee bowl” traps at 11 sites in NY state. I caught wild bee pollinators in the canopy and understory of woodlots adjacent to pollination-dependent fruit trees. Woodlots were dominated by wind-pollinated species, and more than half of captured bees were known apple pollinators (Russo et al. 2015, Blitzer et al. 2016). Canopy bees were highly abundant during tree bloom, and rapidly declined after, supporting the idea that bees were foraging. Here, I propose three research objectives investigating(1) bee foraging preferences on tree species, (2) the trees that provide optimal nutritional quantity and quality, and (3) bees’ exposure to pesticides when visiting forest and hedgerow trees near orchards. (1) I will use DNA barcoding to identify the pollen from guts of trap-caught wild pollinators. Traps demonstrated immense diversity of canopy-foraging bees, but not which trees the bees preferred. Molecular pollen identification methods will provide detailed tree pollen use by the wild pollinating bees. I hypothesize that pollen preferences vary over space, time, and the gradient of forest cover in the surrounding landscape. (2) I will quantify the pollen quality and quantity of important forest and hedgerow trees with metrics relevant to bee health. To estimate pollen quantity, I will improve estimates of flower abundance for trees and shrubs in an in-development floral resource database for the Finger Lakes region of NY (Iverson et al. unpublished data), then combine these data with per-flower estimates pollen abundance. The only available pollen quality data is missing many local species and provides only protein content (Roulston et al. 2000), while protein:lipid ratio of pollen is most important for pollinator choice (Vaudo et al. 2016a, 2016b). I thus propose to collect and calculate protein:lipid ratios for the common wind- and insect-pollinated forest trees and compare these with apple pollen in adjacent orchards. I will ask if the preferred trees identified in objective (1) also have the highest quality or quantity pollen. (3) I will quantify pesticide residues in the pollen of forest and hedgerow trees. Using pollen from trees collected 100-500m from the orchard, I will analyze pollen samples for 41 compounds commonly applied in our landscape at the Cornell Chemical Ecology Core Facilities, through the McArt lab. I will calculate toxicity estimates based on the literature and compare wild tree pollen toxicity relative to apple pollen. The purpose of this project is to identify the forest, woodlot, and hedgerow tree species that are most important for supporting fruit tree pollinators. While much research has focused on herbaceous wildflower plantings for pollination services in agricultural crops (Blaauw and Isaacs 2012, 2014, Grass et al. 2016) , almost nothing is known about how forest and shrub resources support pollinator populations and effect pollination services. This is a surprising gap in knowledge since forests and forest fragments commonly surround orchards in the Northeastern US, and the resources they provide may be critical for robust pollinator populations. For example, our own data from flower counts taken in spring 2017 found the number of flowers on a single canopy maple or oak tree often exceed 600,000 or even 700,000 blooms/tree. A single male red maple can present up to 1350 flowers/m 3 of the outer 2 meters of canopy, which translates to an estimated 1.35 ml nectar/m 3 (Batra 1985) . This exceptional resource likely contributes to findings that natural forest habitat and plant diversity support thriving pollinator populations in apple orchards in the northeast (Park et al. 2015, Kammerer et al. 2016) , yet these patterns have never been measured directly, nor is the contribution of specific tree and shrub resources known. Of the 416 species of wild bees in New York State, over 120 species have been found visiting apple orchards (Russo et al. 2015, Blitzer et al. 2016) . Wild bees emerge after spring thaw immediately requiring pollen and nectar, and forests are among the only available forage resources (Chambers 1968, Russo et al. 2013) . Since the orchards they pollinate will not bloom for several weeks, bees require other resources to stay active until crops bloom, and to amass sufficient resources to reproduce to maintain healthy populations each year (Schellhorn et al. 2015) . While spring ephemerals certainly provide pollen and nectar and are the focus of much research (Motten 1986, Williams and Winfree 2013, Parker et al. 2016, Austen Emily J. et al. 2018) , they pale in comparison to the sheer number of flowers in the canopy. Although their nutritional quality has never been investigated, many scattered literature observations suggest wind-pollinated trees are visited by diverse bee species (Chambers 1968, Raw 1974, Russo and Danforth 2017) . A healthy wild bee population reduces the need to rent honey bee hives and provides pollination services in poor weather and unpredictable climates (Blitzer et al. 2016) . Biodiverse pollinator populations are insurance against climate change, pests, and diseases, as bees with different traits respond differently to climate pressures (Bartomeus et al. 2013) , so species diversity supports economic security in the form of a successful crop each year (Aizen and Harder 2009, Garibaldi et al. 2013) . It will thus directly inform land management for fruit tree pollination services and thus crop viability to identify the preferred tree species and the quantity and quality of pollen they produce for a maximally diverse bee population. al. 2016) . There is also widespread cultural interest and knowledge around managing for wild bees. A recent survey of over 600 orchardists in New York and Pennsylvania found that 93% of respondents highly valued wild pollinators, and sought to actively manage their land for wild bee conservation (Park et al. 2018) . Some orchardists are now choosing to rely entirely on wild bee services (Dunn 2018) . Wild bees often suffer from nesting habitat and forage loss associated with land-use change and agricultural intensification (Steffan-Dewenter Ingolf et al. 2002, Carvell et al. 2006) . Wildflower plantings, a frequently suggested solution, can increase wild bee abundance, diversity, and pollination services (Blaauw and Isaacs 2014) , yet such strips require expensive establishment and are often overtaken by weeds requiring herbicide management (Landis and Savoie 2018) . In contrast, once established, perennial trees and shrubs provide resources to bees in addition to long-term benefits such as soil stabilization, wind breaks, carbon sequestration, timber, firewood, shade for animals, and even maple syrup or nuts (Farming the Woods 2014, Graham and Nassauer 2017) . Thus, identifying the forest and hedgerow species which provide food to bees could successfully maximize ecological services and increase not just fruit pollination but whole-farm ecological and economic sustainability (Bommarco et al. 2013)(Potts et al. 2016) . There is a growing call for basic research into insect use of wind-pollinated resources, a large portion of which are early-blooming trees (Saunders 2018) . Their pollen-releasing catkins are not showy or colorful, so not traditionally understood as attractive to bees and thus ignored in forest resource calculations. Yet several “wind-pollinated” species are in fact used extensively by bees and partially pollinated by insects, including willow (Peeters and Totland 1999) , several maples (Sullivan 1983, Batra 1985) , linden (Anderson 1976) , and others. Scattered historic data suggest that bees frequently collect from wind-pollinated oak, ash, beech, and birch (Chambers 1968, Raw 1974) . Thus, to understand how to select forest and hedgerow trees to support pollinators, we must re-evaluate the importance of these less-showy resources. Therefore, I propose here to calculate the use patterns and quality of this resource for the broad community of wild bees in order to fill this knowledge gap. During the fall of 2018, I processed the nearly 1,700 bees caught in forests and orchards in the spring of 2018, where I sampled in 11 different forest-orchard pairs across the Finger Lakes region of New York State. Prior to receiving the SARE grant, I worked with each of the growers to confirm sampling goals and areas. In five trees per forest, I used a “Big Shot” 7-ft slingshot to launch a weight attached to a thin rope into a branch crotch high in the canopy. Once positioned correctly, I then reeled a bee trap into the canopy, and installed a paired trap at ground level. Traps were “bee bowl” cups in standardized fluorescent yellow, white and blue, each color of which is known to attract a different suite of bee species and together are a standard bee sampling method. Five similar traps were deployed in adjacent orchards in the branches of apple trees. 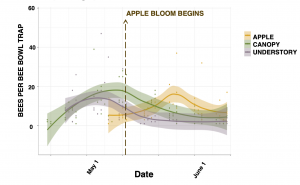 Bees were collected weekly from each trap at all sites, beginning in spring immediately after winter thaw and continuing one week after apples finished blooming across all sites (in 2018, second week of June). Objective (1) is to identify the pollen carried by different bee species. This will allow us to understand which tree species in the early spring forest are most important for wild bee pollinators. In the first step towards this answer, an undergraduate mentee and I dissected each of the bees collected in 2018, which had been collected into 95% Ethanol. Bees were surface sterilized so no contaminant pollen was collected. Dissection was done carefully to remove only the internal guts, but not damage the structure of the bee’s external integument, so that they might still be identified to species under the microscope. All guts were immediately placed into individually labeled tubes and placed in the -80C freezer, to maintain them for future identification via molecular (or microscopy) methods. Following dissections, bees were then pinned and individual labels with QR codes were generated for databasing and accessioning into Cornell’s permanent insect collections. Bees have been sorted to morphospecies and species-level identification of each bee is under way. Objective (2) is to identify the pollen quality of different species. Last spring, I collected branches from 15 common tree species in local woodlots, and collected all pollen that dropped from these blooms after they dehisced in order to obtain a pure sample of each. Amount of pollen per blossom and blossoms per “twig” vary by species, and thus this spring, I plan to re-collect pollen samples in order to standardize sampling across sites and species. Also ongoing: we are fine-tuning tje methods for quantifying pollen quality amounts via protein:lipid analyses (the bee-relevant metrics to be measured for all tree species in the study). With my advising team and post-doctoral scholar Aaron Iverson, we are currently developing the sampling protocol to estimate blooms/tree for all common tree species in regional woodlots, while taking into account variables such as tree age and canopy position. All protocols will be available in the upcoming reports. These numbers will allow us to understand the bee-relevant diet quality in the context of the availability of those resources on the landscape. As the funding for this project has just begun, many sample analyses are still in progress, or the data are yet to be collected! 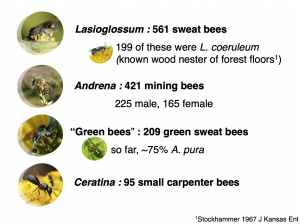 However, preliminary data analyses suggest that the bee community is strongly similar in the forests as to the orchards a few weeks later. This supports the logic motivating the project as funded. Schematic preliminary graphs characterizing the forest composition (measured with variable radius plots using an angle gage, BAF 10) and light levels (measured with a hand-held densiometer; superimposed bloom windows estimated to represent dates compiled across sites). Bees were most abundant in early spring in the understory and the canopy of forests, and later were highly abundant in adjacent apple orchards. This seems to roughly correspond to active bloom times, although pollen analyses will confirm species usage across species. 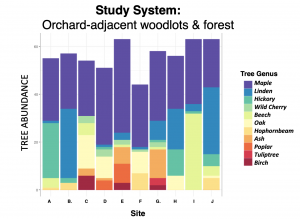 To illustrate the “habitat sharing” of a species that is found both in forests and orchards, the graphic below compares 10 years of apple orchard bee species data to the bee species caught in the forest canopy just 1 year (2017, itself a very rainy spring with low bee activity)! 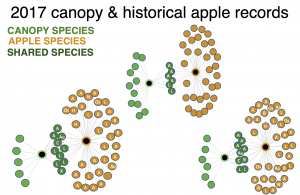 Many of these species were found in both apple and orchard habitats (shared species represented by dark green circles). We expect this number only to increase as we finish the 2018 bee species identifications and further future sampling. The most common groups of bees were sweat bees, “green bees,” small carpenter bees, and ground nesting mining bees, who include the most effective orchard pollinators on a per-visit basis. Nearly all genera were found in both the canopy and the orchard in 2018, although some species do prefer one or the other habitat. Also, in some cases, the male of a species is predominantly found in the canopy, while the female is found in the orchard. Our future work will investigate which trees all of these groups are visiting for pollen resources. After gut dissections, we were also immediately able to discern several simple patterns. Female bees were more likely than male bees to have pollen in their guts (generalized linear mixed effects model with a binomial logit link. female estimate= 0.65; male estimate = 0.10, z =9.02, p= <0.001). This suggests that females consume more pollen than males; this is expected as they require protein in their diet to lay eggs. However, male bees may also be consuming pollen more than previously expected. Female bees in the canopy were more likely to have pollen in their guts than those in the understory (Generalized linear mixed effects model, binomial logit link. canopy estimate= 0.66; understory estimate = 0.36 z =2.18, p= 0.029). 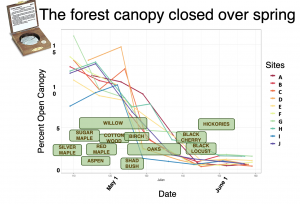 This suggests that the canopy catches may indeed be due to foraging in those treetops. 1 Insectapalooza: pollinator outreach & education in the context of Cornell Entomology's annual public outreach event! I worked in an exhibit focused on bumble bee ecology. July 2019: I have been invited to host a two-day workshop at the Yale School of Forestry for an undergraduate summer field biology course hosted by Yale Forestry Professor Marlyse DuGuid; this will involve several interactive lessons, field day for bee observations and collection, sample processing & insect pinning lesson, and bee identification and construction of “interaction networks” of field plants and pollinators. I will also give a seminar at the Yale Myers Forest for their weekly “quiet corner initiative” summer research symposium (typical audience: ~60 rural landowners and Yale Forestry students in the northeast corner of CT). Planned: article contribution for Fruit Quarterly on results of pollen identification of important forest trees for orchard wild bee pollinators. 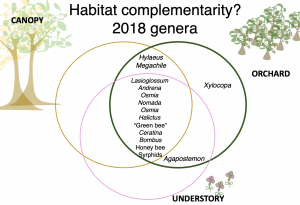 I hope that this project will contribute to future sustainability by directly integrating pollinator conservation into agroforestry, silvopasture, and small-farm woodlot and hedgerow management. This will be particularly relevant for apple orchards, the focal commodity of our lab’s research. However, many crops and wild plants benefit or even entirely rely on ecosystem services provided by free-living pollinators. The funding for this project has only just begun! However, I am eager to continue working with growers, researchers, and community members to answer these exciting questions about the role of woodlots and forests in wild pollinator conservation. I am committed to sharing the knowledge I gain through careful research and collaboration. In my future career, I hope to work at the intersection of extension and teaching, either through non-profit government or a joint extension/teaching faculty position. This current SARE project is deepening my natural history knowledge in the context of working agricultural lands, and should generate concrete outcomes in terms of being able to recommend woodlot and hedgerow management for pollinator conservation. Given the importance of trees for soil stabilization, wind breaks, carbon sequestration, forage, and numerous other sustainability benefits, I am particularly excited to find myself poised at the cusp of integrating pollinator conservation with these efforts.